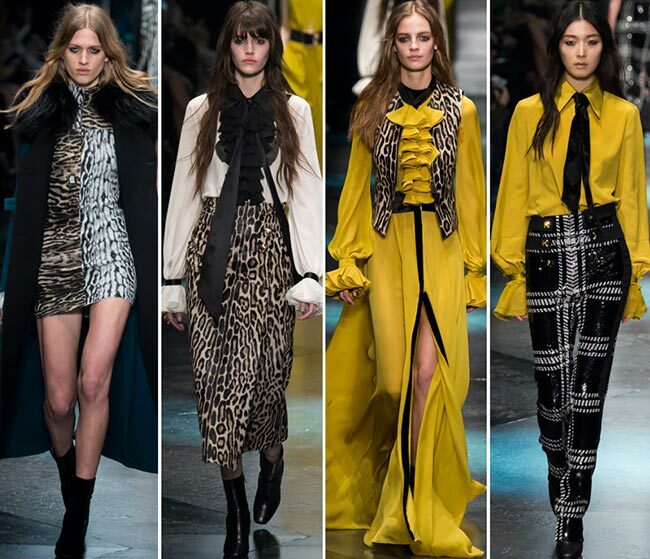 The Roberto Cavalli fall/winter 2015-2016 collection has us staring with an open mouth, feeling the blood rush down as we are faced with the sexiest of designs on the Milan Fashion Week fall 2015 runway yet, full of leopard print and so much sass. There is something to be said about a collection that brings the focus on the feline elements of a woman, capitalizing on the effect that has on their male counterparts. 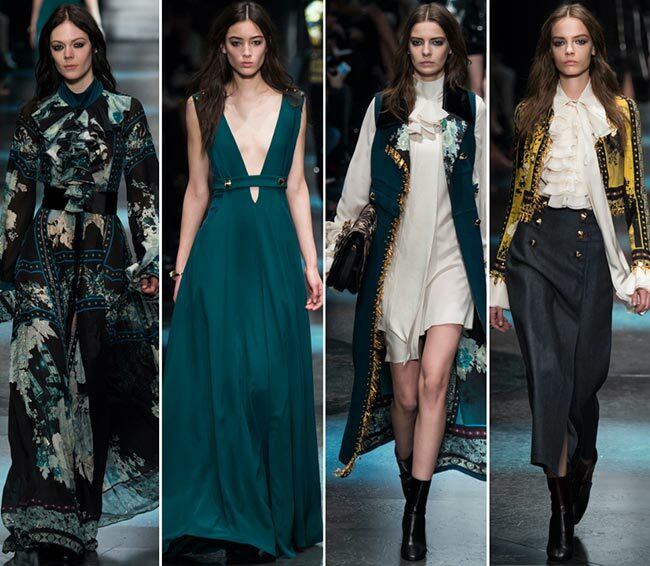 Of course, it wasn’t all about the leopard when it came to this particular collection that really had us going with its pirate themed dresses and the wide array of themes covered. Talking about a pirate theme, from the ruffed shirts to the sailor skirts, the embroidered jackets reminiscent of Spanish customs and the modern use of the thigh high lit, we had ourselves a few outfits that brought the power of the female beauty out with gusto. 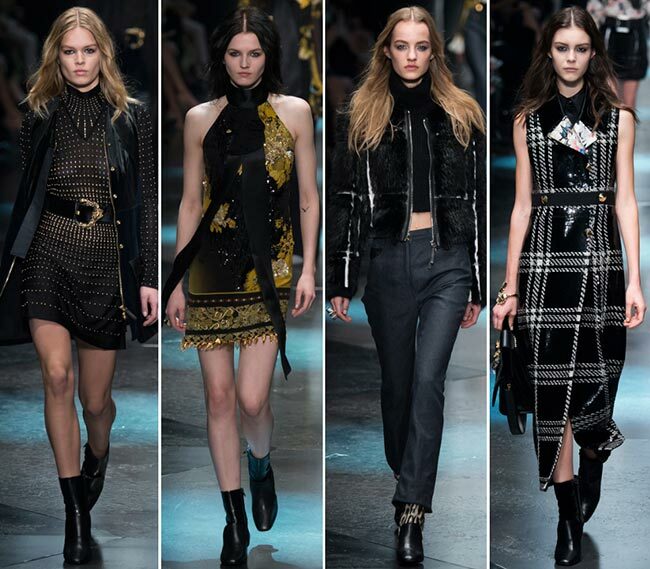 While many designers prefer to stick to a single inspiration, Cavalli seems to love mixing it up and showing off a lot of leg while at it. It may be the year of the midi hem, but this designer prefers to stick to other trends instead, plunging some of the necklines and slitting his skirt up the thighs. 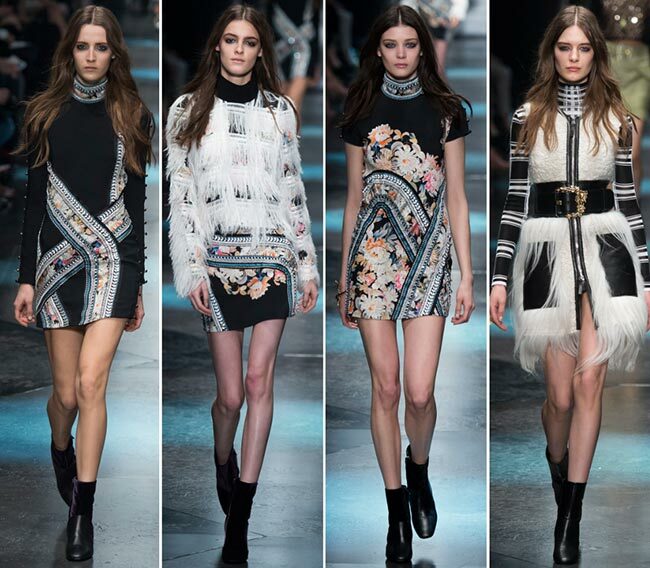 He takes on the black and white patterning, while adding some fringe and feathers to the line-up as well. He certainly does not forget about the floral prints, while he finds inventive ways of showing off skin without making it too obvious. Roberto Cavalli does seem to love the crop top and trouser or skirt with the high waist ideal, which he shows off so lovingly prepared for us ladies with a love for fashionable wear. The waist is also revealed in dresses that have diamond cut-outs all along, cinched in with a belt. One of the best pieces from the cropped top set is the cropped turtleneck sweater under the blue black leather jacket, the midriff shown off while wearing ankle cropped straight leg pants that fall lower on the waist and leopard lined black leather booties underneath. The dresses with the diamond cut midriffs come in many colors, particularly ombre shades, with the best being a light blue and purple died pleated lightweight fabric that could very well be the dress of angles on the clouds above us. Shimmering lace dresses make it in the Roberto Cavalli fall/winter 2015-2016 collection as well, while lacy tops that show off the best underneath are not far behind. We do love the way Cavalli plays with the lacy fabrics in different colors, particularly the reds. Some of the wackiest pieces included film strip designs that somehow also incorporated floral prints, one of which is a long sleeved sweater dress with a turtleneck that itself is a film strip print, while the hemline falls to above mid-thigh, finished off with velvet lined black letter booties. 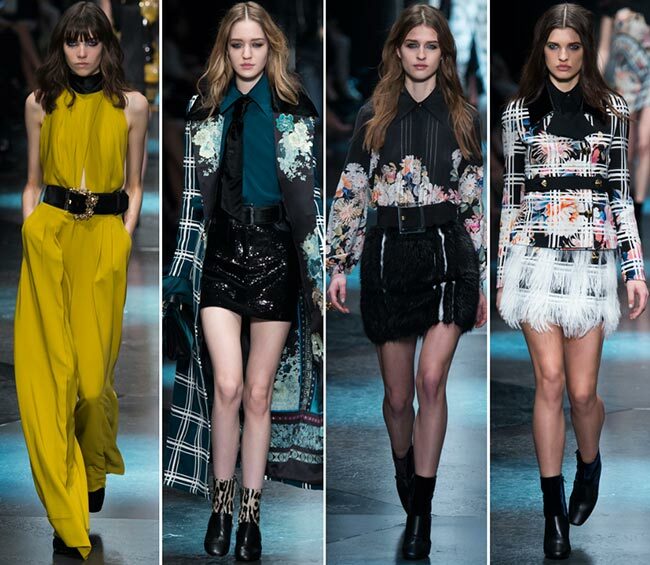 The colors of the whole line-up include lots of black and blue, yellow and white, brown and camel. There is teal and there is gold, navy and olive, red and orange ombre. 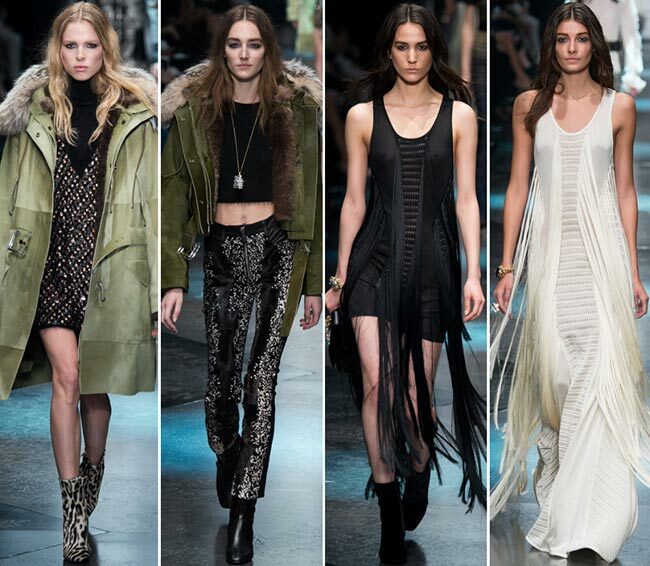 Some are belted and some are not, some have high neck and others plunging V’s instead. 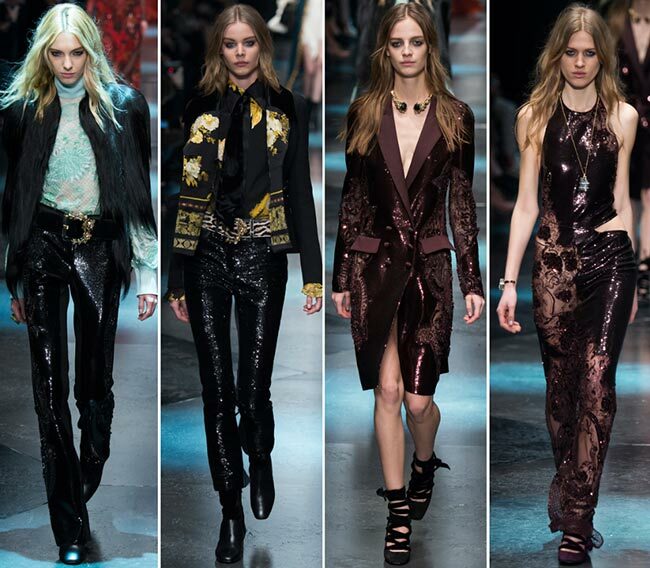 Most of all, every single piece has us falling in love with the Roberto Cavalli fashion house all over again.